Government Adda 247 ESIC Government jobs ESIC Recruitment for 539 posts. 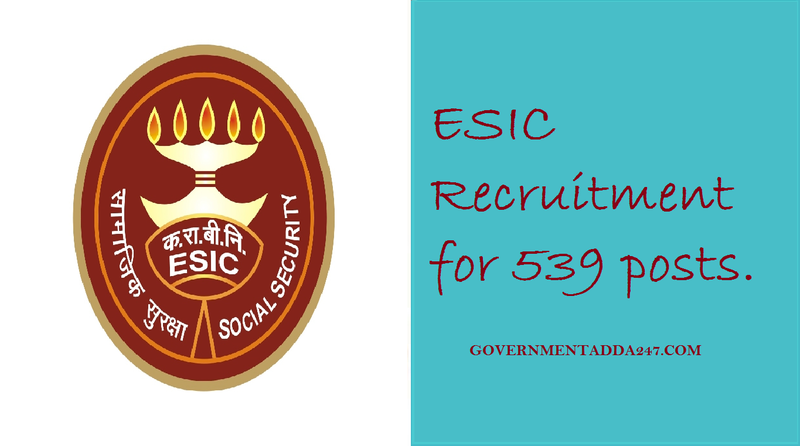 ESIC Recruitment for 539 posts. 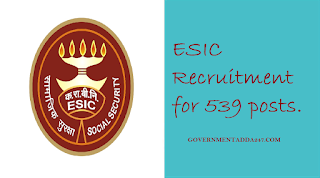 ESIC Recruitment Employees' State Insurance Corporation recruiting for the post of Social Security Officer/ Manager Gr-II/Superintendent as per the advertisement released by the ESIC. The total vacancies for recruitment are 539 vacancies. The application is inviting from the eligible aspirants who fulfill the eligibility criteria for the posts. The eligibility criteria for the post is candidates must have A degree of a recognized University education qualification. The applications are inviting from 13 September 2018 and the last date to submit online application is 05 October 2018. To know more about the ESIC Recruitment check the information which is given below. ➤JOIN WHATSAPP FOR DAILY UPDATES. आयु सीमा : न्यूनतम: 21 साल, अधिकतम: 27 वर्ष, यानी एक उम्मीदवार का जन्म 02.08.1991 से पहले नहीं हुआ होणा चाहिये और 01.08.1997 से अधिक नहीं (दोनों तिथियां सम्मिलित). ऊपरी आयु सीमा अनुसूचित जाति / अनुसूचित जनजाति 5 साल, अन्य पिछड़ा वर्ग 3 साल, विकलांगों को 10 साल, पूर्व सैनिक को 5 साल. IMPORTANT NOTE REGARDING ESIC RECRUITMENT. Recruitment Notification dated 16-01-2018 for the esic recruitment of social security officer/ manager gr-II/Superintendent in ESIC stands canceled vide notice dated 03-08-2018. The list of aspirants who had applied against the advertisement dated 16-01-2014 is already uploaded on ESCI website along with cancellation notice dated 03-08-2018. All candidates who had applied against the esic recruitment dated 16-01-2014 have to apply fresh. Any category of an applicant who had applied against the advertisement dated 16-01-2014 and now becomes age barred due to change in crucial date are granted age relaxation to that extent and they will also be exempted from payment of application fee on furnishing the correct registration no of a previous application. In the case in esic recruitment, it is found at a later stage that the registration number provided by the candidate is incorrect or the registration number provided by the candidate belongs to any other candidate, the candidature of such candidates shall be summarily rejected.